Small Heart Small Heart Pet ID Tag  - $7.00 : Your Pet Store, Made in the USA! 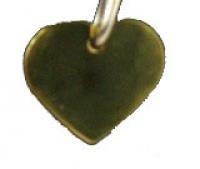 This is a tag in the shape of a heart and is available in brass, or gold, only. The picture of the tag is the actual size of the tag. The measurements of the tag are 1" wide and 1" tall. This tag is appropriate for dogs from about 2 lbs to 20 lbs. If you are looking for a different colored heart, please see the large heart tag.